Whiteside Manor offers several drug and alcohol treatment programs to help you or your loved ones in recovering from addiction. Our Southern California treatment programs are designed to get our clients back into leading a healthy and natural lifestyle without the presence of drugs or alcohol. I was at Whiteside Manor Wilshire house from December 20th to February 2nd. My clean date is 12-21-13 to present. I was writing this formal letter to express my gratitude and to share what skills and options this program offered me to utilize that had truly aided in my success. I entered Whiteside much like other drug addicts in active addiction, broken, confused, homeless, unhappy, terrified and very angry. I also have a dissociative disorder that was extremely symptomatic at the time of my entrance. I had gotten turned away from more then one addiction rehab facility due to criteria for treatment as well as my poor behavior. Getting clean and staying that way felt absolutely imposable and I was starting to feel like no one could help me, and I most certainly didn't comprehend the steps I needed to take to help myself. I came to Whiteside on a referral from someone in the professional field. I was sent specifically to be under the care of the case manager Gina. I was disrespectful and had many outbursts that were discharge worthy. Gina by her own choice and confidence in her abilities, made the decision to continue to work with me when it was not easy and most certainly not always deserving. She never gave up on me, nor did she ever go back on her word. I come from a background of instability, foster care, jail, homelessness, and trauma. The kind of support love, tolerance and faith I received from Whiteside was something I did not quite understand at the time, but I can honestly say now, with no doubt in my mind, that it made the difference between me living or dying. I developed healthy relationships and trust among the other clients and staff. Things I thought were imposable were suddenly possible. I also want to thank you Ron, for paying for my first month of sober living. I am still happily living there with my service dog, Sammy. After leaving Whiteside and with my carefully designed exit plan, I was and am able to handle anything that comes up in my living situation in a manor that is appropriate and not nearly as destructive as I was before going through the program. l have made the decision to continue therapy, I attend and have commitments at meetings throughout the week. I have a sponsor, and I am currently working through the Twelve Steps. I am also still in touch with Joy Kentfield. I talk to her on the phone and go in once every month or so for maintenance of my newly learned skills. Since I've left Whiteside in the last six months I have also finished my vocational school and upon graduation, I have acquired my RRW (Registered Recovery Worker) credential and am currently interning at Sunrise Ranch Recovery. “We can only keep what we have by giving it away." And for the record ... I absolutely love my job! I plan to continue college at CBL (Cal Baptist) in 2015 for my BA in counseling psychology with a minor in neuropsychology. Now as I'm on my way to being a certified addiction counselor. I strive to the best of my abilities to be just as qualified, compassionate, patient selfless and devoted as Gina. Whiteside Staff has set an amazing example to follow, with values of which I choose to apply in all aspects of my life. I mainly wanted to write this letter because the only way I can think of to remotely give back is to express just how helpful and life saving the program Whiteside Manor was for me. I am proud to say that I attended this program every time someone asks me how I got clean. I plan on doing great things with my life. I have big dreams and great goals that I know now could be achieved. I have so much hope. The first step for me was getting clean. Whiteside is where my journey began. I don’t know where it will end, but I do know that what started out as nothing more then a good idea, I now get to make my reality and live it every day. Today I get to live free from active addiction. “ After losing my 17 year old to suicide I had lost control to every aspect of my life. I began using amphetamines, marijuana and opiates. “ I have been in residential treatment at the Wilshire Street location for 31 days. This has been a highly educational and therapeutic experience. I’m receiving both one to one and group instructions and counseling. Whiteside also provides access to counseling from my private health care provider. “ My name is Lisa, and on December 28th 2013, I will have seven years sober! Before I went to the Whiteside Manor program, I had been to over nine programs for my addictions. For years I used meth and alcohol and any other drug I could find. I lived on the streets and parks. I lived everywhere. Whiteside helped me become a sober loving mom. This program helped me, and gave me the tools to continue on my sober path. I dealt with my deep and emotional issues that help me let go of it I felt with my addiction. The program taught me how to apply meetings, AA or NA to my life. Today I have my kids in my life, and today my family and friends can depend on me. I am no longer a slave to my addictions. I am free to be the mom I always wanted to be. 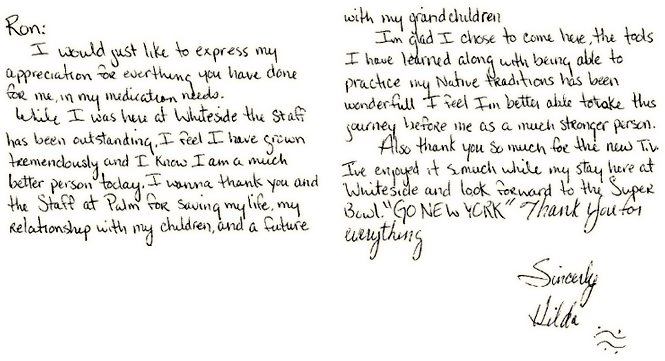 “ Whiteside was the third treatment program I had been to, and was by far the best. They helped me to understand my physical addiction to alcohol, as well as the emotional reasons I felt the need to drink. “ Let’s see. I could write a book about my feelings about Whiteside. When I first entered Whiteside I felt like a warm and safe blanket wrapped about me. The staff is incredible. It seemed like they are united together to make me feel like they wanted me in their home. “ I thankfully fell into an early morning meeting that rocks, and I'm hitting ten meetings a week. I have to say that things are better than ever, and I thank you for helping me to that end. “ I lived an incredible sober life for 22 years. Lost my sobriety via pain pills and didn’t know how close I was to losing everything or dying. I spent $20,000 was loaded again in 30 days. I hit bottom and knew of Whiteside’s reputation. It’s not about the money there. The staff is incredible. My life is better than ever. I love the place and miss it!